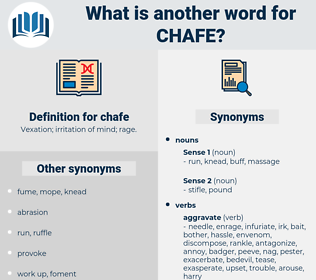 What is another word for chafe? Vexation; irritation of mind; rage. mend, heal, assist, please, help, cover, fix, placate, calm, smooth, make happy, aid, build, rebuild. 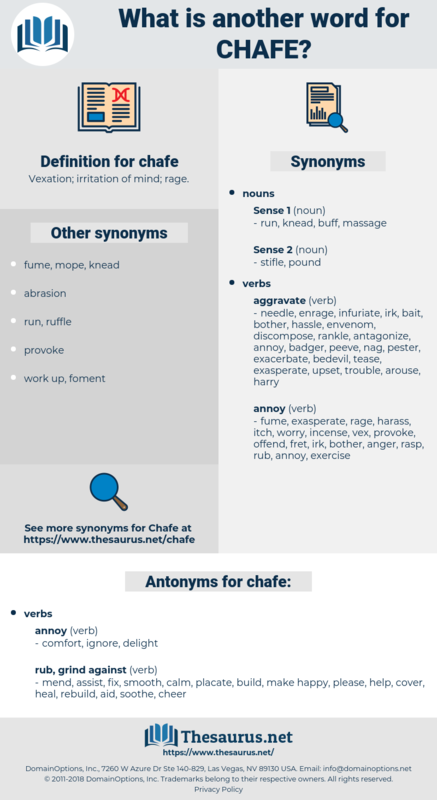 cheer, reassure, oblige, solace, console, assure, quiet, soothe, content. As for my laurels, they have not yet begun to chafe. Lord Grey, whose whole nature inclined him to move along the path of progress with slow, steady, and stately steps, began to chafe against the eagerness with which the more Radical reformers were endeavoring to hurry on the political movement.